The volume of to be filled liquid can be maintained on the touch screen-PLC unit itself, without disturbing the syringe physically unit. Co- Eccentric Nozzles allows Very Quick and precise Filling of liquid with Simultaneous nitrogen flushing. Each individual part that is required for autoclaving can be mantled and dismantled very easily. Can run both dry as well wet rubber stoppers. 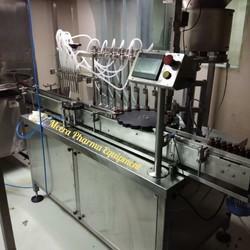 Automatic Vial filling sealing machine. 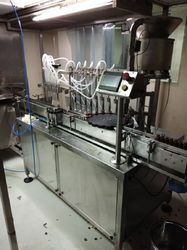 Looking for Inkjactable Filling Line ?